I love to crochet hats for new babies. 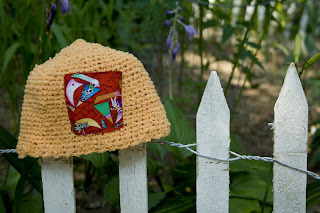 This one is made of cotton with a fun little patch of fabric on the front from my fabric stash. I turned the edges of the fabric in and hand sewed it on with embroidery floss. Hopefully it will keep sweet, baby River warm this winter in the Pacific Northwest. That is really a very cute idea.